I’ve been aware of Red Bull Global Rallycross for years, but never knew very much about it. I knew that it was European style rallycross, wheel-to-wheel racing on a mixed surface circuit, but that was about it. This past weekend, my wife Elana and I joined the RFD crew in Washington DC to check it out for ourselves. Most of my own experience comes from track days, which take place on completely paved circuits, and stage rally/rallysprint events, which are generally on dirt. 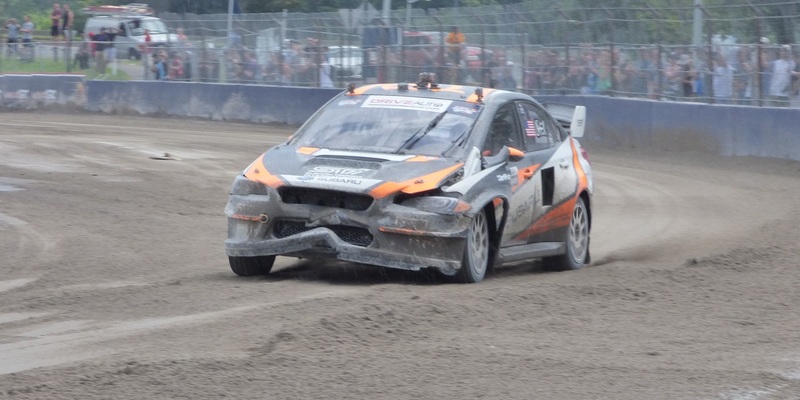 Unlike the SCCA definition of rallycross, which is essentially an autocross on a non-paved surface, GRC mashes up track and rally racing. It’s a track, but there’s both pavement and dirt. There’s even a jump, which you don’t see at your local roundy-round track whether it’s dirt or paved. In fact, it reminded me a lot of the AMA Supercross event I went to in April – a track, set up where there isn’t normally a track, with dirt and jumps and things to entertain the crowd. I had fun at Supercross, so already my hopes were high. We attended the press meeting, learned where we could and couldn’t go, and got our media credentials. This allowed us past the chain link fence that kept everyone else ten feet back from the concrete barriers at the edge of the track, which we could go right up to. 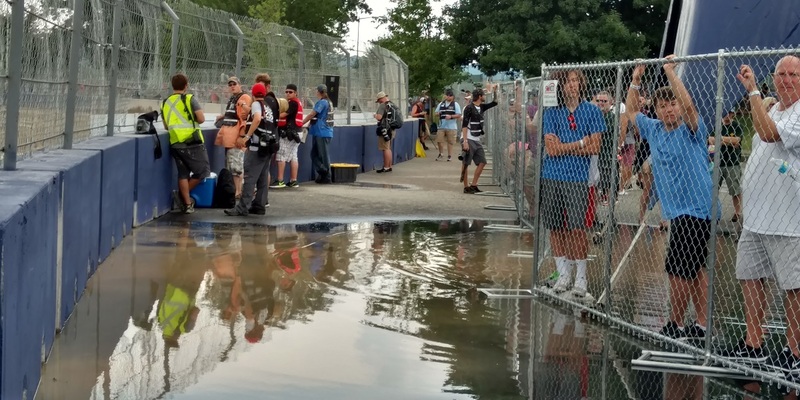 They even thoughtfully cut holes through the chain link fence at the edge of the track specifically for us to get clear shots of the action. But honestly, ten feet closer was all the media creds got us. 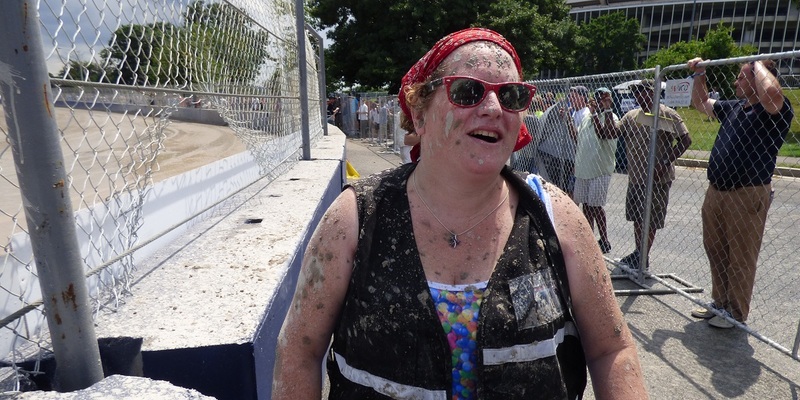 That’s not a complaint about media access, but praise for how open GRC is to everyone. The pit area is wide open. Everyone can wander in, get a look at the cars up close as they’re bring worked on, and talk with the drivers. RFD‘s Danny Korecki got a photo with Bucky Lasek. Ike and Tanner Foust exchanged greetings in passing. Elana and I had a nice chat with GRC Lites driver Conner Martell (New England represent – he’s from Vermont). I showed him a picture I took of his car in mid-air over the jump during his last track session. He liked that. None of these interactions with the drivers were media exclusives. (Michael Thompson’s ride with Bucky Lasek was, but that’s different.) 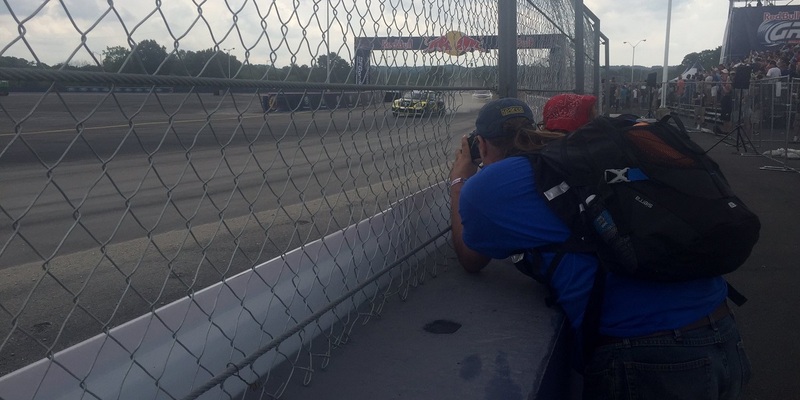 I think that’s one of the best parts of Red Bull GRC – they let spectators get quite close to the drivers, the cars, and the action. That’s something I love about stage rally, and Red Bull GRC has carried that aspect over to their own format quite successfully. Except rather than spending hours in the woods waiting for a few minutes of cars passing by, as you do when watching stage rally, there’s plenty of action going on to keep you entertained. Like AMA Supercross, with their separate 250cc and 450cc classes, GRC has their Supercar and Lite classes. Each class runs separately, giving them a chance to work on the cars while the other group races. The only real downtime is that which is necessary to resurface the dirt areas, rebuild the jump, and wait out the occasional torrential downpour. Racing isn’t the only activity to check out. There’s plenty of action off the track, too. 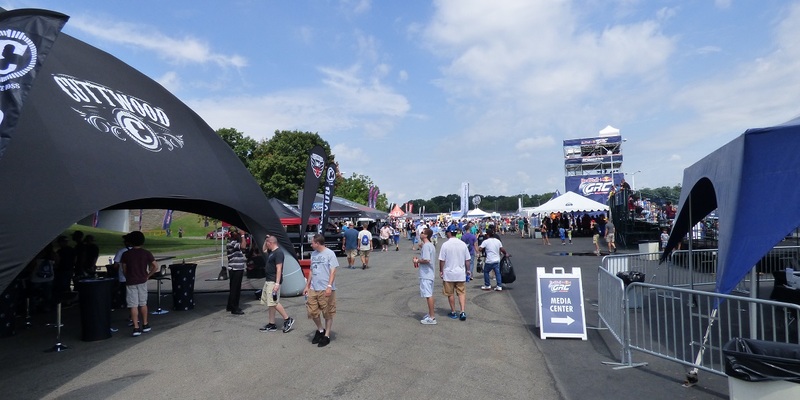 Ford, Volkswagen, Subaru, and Honda all have tents, displays, giveaways, and contests. Forget “race on Sunday, sell on Monday.” Here they can race and sell at the same time, despite the fact that I can’t walk into a VW dealer and drive home a race winning 600hp AWD Beetle (I wish!) But I did get to compare a GTI and Focus sit-behind-myself back seat test. Between that and my earlier WRX review, I know how all of these back seats compare now. The GTI wins with more headroom, the WRX is about the same as the Focus despite not being a hatchback, and I can fit comfortably in all three of them. 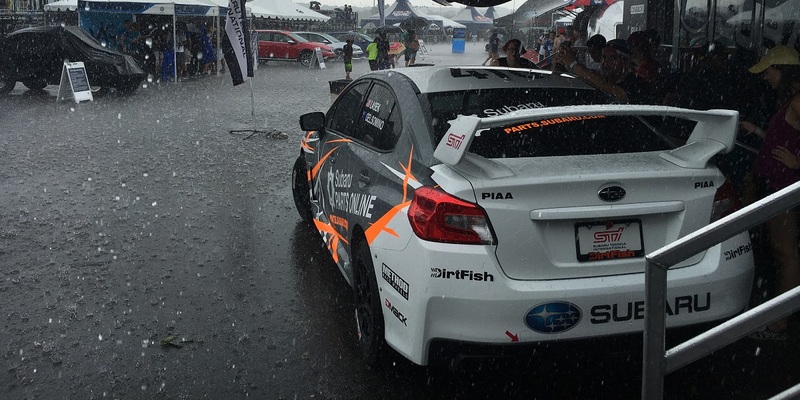 Speaking of the WRX, Elana got to get behind the wheel of Bucky Lasek’s stage rally car, and Subaru Rally Team USA kindly allowed us to take shelter under their tent when torrential rain passed through midday. Other sponsors, like BF Goodrich and Advance Auto Parts, had tents and displays as well. So did the Washington DC Region SCCA, cleverly promoting their form of rallycross that anyone can do. There were plenty of local food trucks selling lunch, a pleasant alternative to the standard generic and overpriced stadium vendors (I like supporting local small businesses, wherever I happen to be). But back to that ten foot area between the fences, where only media and flaggers were allowed to tread. It was intense being that close to the race. I couldn’t quite reach out and touch the cars (not that I’d want to), but it was close enough for eventual race winner Scott Speed to hit me in the eye with a rock his Beetle launched as he roared by during qualifying. Ouch! That took me out of action for a few minutes. It’s also why the general public isn’t allowed that close to the track. I literally signed up for that risk when I signed the waiver. I quickly learned to keep half an eye watching for incoming rooster tails, and to duck and cover when they did. I was thankful for that lesson after the midday rain storm, when the gravel turned to mud. Otherwise I would’ve ended up looking like my wife. This isn’t the girly kind of mud bath. Don’t worry, even spectators outside the fence sometimes found themselves in the wrong place at the wrong time, wearing parts of what used to be the dirt track. Fortunately we’d packed shirts in case of rain. I didn’t think we’d need them for the mud bath. A GRC Lites heat starts. There’s very little downtime here. One of the biggest problems with stage rally is that it takes place in remote locations. Spectating is difficult, as is making TV coverage exciting and interesting (though not impossible, as Subaru’s Launch Control has proven). 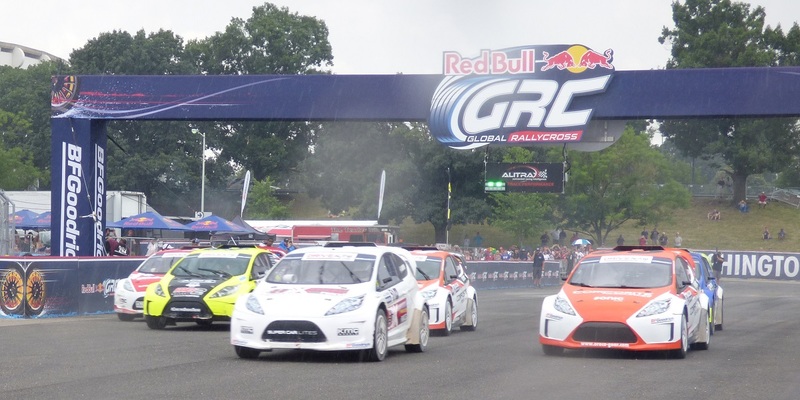 Red Bull GRC takes the best parts of stage rally and combines them with aspects of circuit racing that make it palatable both to spectators and TV viewing, and NBC has taken the opportunity to air it live. (One time I walked by VW’s pit area their entire crew was glued to the TV, watching what was happening on the track just a short walk away. They could see more of the race on TV than with their own eyes.) Media coverage brings sponsors, sponsors bring money, and money brings a successful racing series. A variety of interesting drivers from rather different venues helps, too. On the one hand, you get action sports stars like Bucky Lasek and the late Dave Mirra. On the other hand, you get serious racing drivers like Scott Speed, a veteran of both NASCAR and Formula 1. Most of us know Tanner Foust from Top Gear US, but may not know that he also competed in Formula Drift and stage rally. 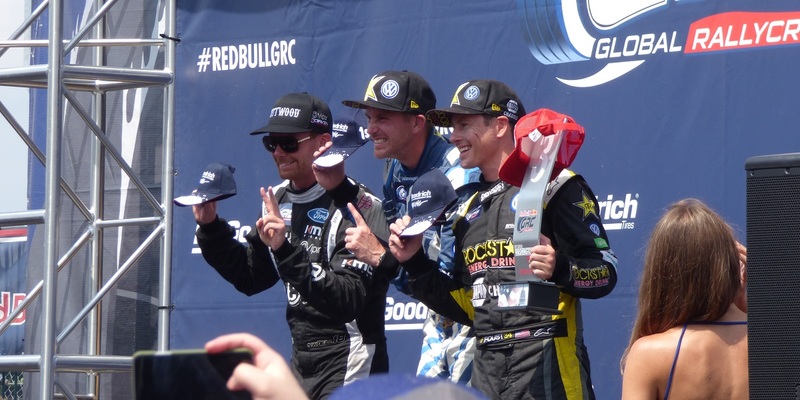 Scott Speed, Patrik Sandell, and Tanner Foust take the podium. Despite the downpour, the muddy clothing, and the rock in my eye, I had an excellent time. If you’re a car enthusiast (and if you’re not, why are you reading this?) 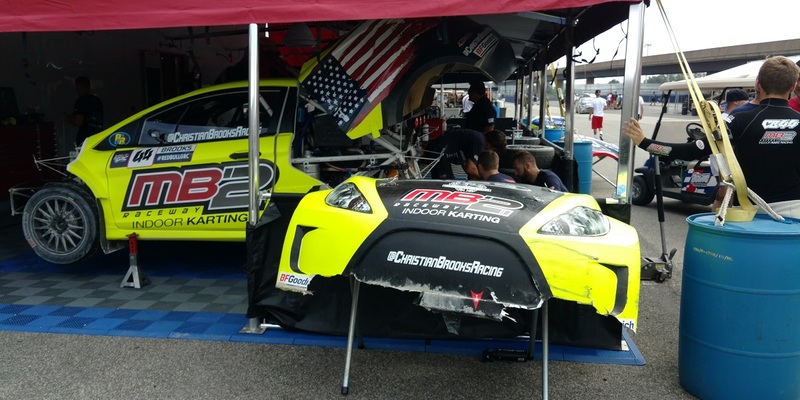 and there’s a Red Bull GRC event coming to your area, I highly recommend checking it out. Whether you’re a track junkie, rally fan, or just enjoy watching cars race, slide, jump, and crash, I think you’ll enjoy it as much as I did. Look for more photos and video from this past Saturday’s event soon!